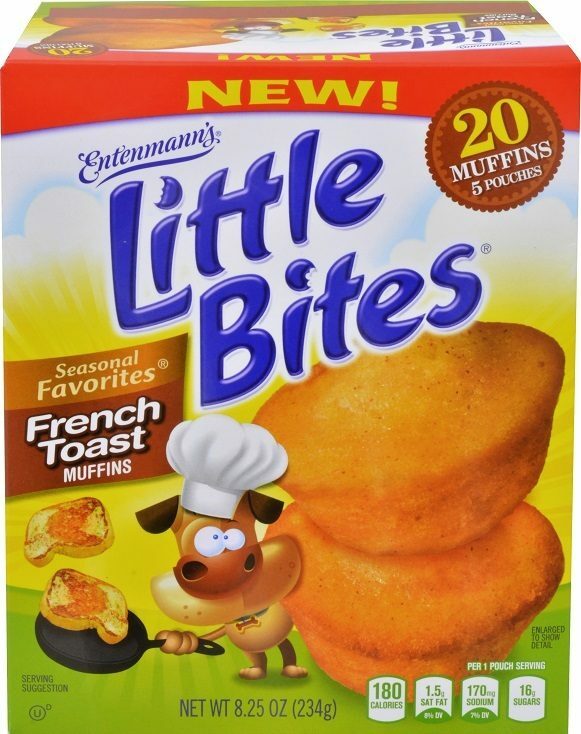 Entenmann's New Little Bites Cinnamon French Toast Muffins Giveaway! You are here: Home / Instagram / Entenmann’s New Little Bites Cinnamon French Toast Muffins Giveaway! Entenmann’s New Little Bites Cinnamon French Toast Muffins Giveaway! I’m a big believer in breakfast, but it’s hard when everyone is running out the door and at different times! That’s why Little Bites Muffins by Entenmann’s have a spot on our grocery list! Now Entenmann’s has added Little Bites Cinnamon French Toast Muffins to their product list (just through May, 2016). They are a big hit in my household! My son-in-law and grandkids are HUGE syrup lovers and these maple infused muffins are their new go-to! These light Cinnamon French Toast Muffins are perfect paired with an apple for breakfast or afterschool snack or slipped into a lunchbox. And they are little bites of Cinnamon French Toast! So yummy! You can even put Little Bites Cinnamon French Toast Muffins in the microwave to add a little warmth to them. Just be sure to remove them from the package first and place them on a microwave safe plate. Microwave for 5-7 seconds (it doesn’t take long) and then enjoy the delicious taste of warm cinnamon french toast muffins or spice them up even more with the tips in the video below! Entenmann’s is offering a fun giveaway for our readers! You can receive a $40 prize pack! It contains 2 boxes of the Little Bites Cinnamon French Toast Muffins, 4 $5 Little Bites coupons and one I Love Little bites DrawString Bag! 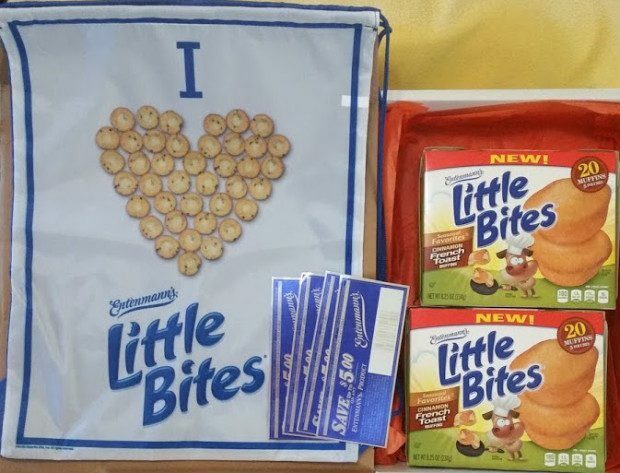 To enter the giveaway, leave a comment letting us know your favorite Entenmann’s Little Bites product. The winner will be drawn at random. This giveaway will end Saturday, February 20th, 2016 at 11:59 pm Central time and the winner will be emailed soon thereafter. Make sure you add [email protected] to your address book, so you get the email if you win! I (Pennie) received the same prize pack from Entenmann’s to facilitate this post. All opinions are my own. Also, be sure to enter “Entenmann’s Start the Rich Life with $5,000 Sweepstakes,” offering up to $15,000 in cash prizes and fun plush toys! If you’re one the lucky winners, here’s what you can win: one (1) Grand Prize winner will be awarded $5,000 in the form of a check, and you can head right to the bank! Ten (10) First Place Prize winners will be awarded $1,000 in the form of an American Express gift card, starting off the new year just right. And that’s not all; twenty five (25) Second Place Prize winners will receive a Rich Frosted Plush Toy. What better way to celebrate the Entenmann’s bestselling donut? Are you ready to Start The Rich Life? Here’s the scoop: the Sweepstakes Period ends on March 15th, 2016 at 11:59 p.m. ET. Visit the Entenmann’s page on Facebook and follow the directions to receive one (1) entry. Entries must be received by February 17, 2016 at 11:59 p.m. ET in order to be eligible. Potential winners will be selected in a random drawing on March 16th, 2016! Good luck! I like their brownie bites. I love their snickerdoodle bites! The Snickerdoodles little bites is my favorite. Every time I have one it reminds me of my nana who always had snickerdoodles in her cookie jar.